Find information on Park events and programs at the Dairy, one of the Conservancy's five visitor centers. Maps, guides, and gifts are also available, all of which support the Conservancy's mission. Park architect and designer Calvert Vaux originally created this charming Victorian cottage as a quiet retreat for children and their caregivers. In the 19th century, the Dairy became a source of fresh milk and snacks. Families came to drink milk and enjoy pastries and ices under the loggia and enjoy the cooling breezes coming from the nearby pond. By the 1950s, the building had become dilapidated. The Parks Department tore down the decrepit loggia and turned the building into a maintenance shed. Then in 1979, the new Central Park administration cleaned up the building and turned it into the Park's first visitor center. 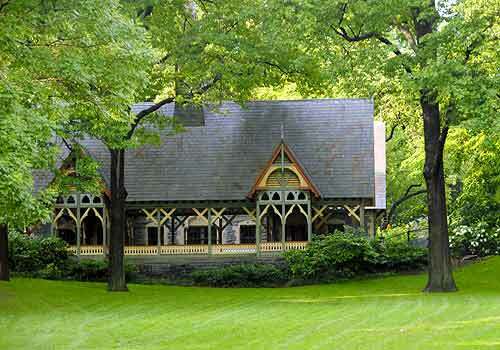 A year later, Central Park Conservancy was founded and the loggia, recreated from historic photographs, was completed.